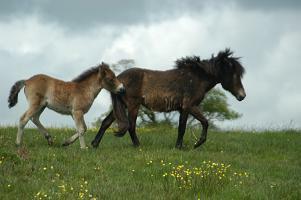 People4ponies was founded in 2003 to help a group of wild ponies. They had been bought by a local farmer, who had lost all his cows in the Foot and Mouth cull of 2001. He had sought advice on what to do with the land, and subsequently purchased a group of 31 ponies to keep his grass down. The ponies did a good job until the crisis was over, but then, the farmer needed to restock his land. The ponies were now surplus to requirements but wild, cross-bred ponies have no commercial value, so the future for groups such as these looked bleak. The farmer and some friends thought that maybe the ponies could be given a better chance in life by being caught, tamed and trained. A group was formed, and a funding application made. Those original 31 ponies bought in 2001 had bred and were now a herd of 53! The priority was to stop the breeding, so we were loaned land to separate stallions/colts (boys) from the mares/fillies (girls). The last foals were born in 2004, and by then, a gelding programme was well underway. The 'UnLtd' organisation funded people4ponies because they liked our idea of using the ponies as a resource for the mutual benefit of ponies and people. The funding money paid for feed for the ponies, wormer, farriery, 26 castrations and vital equipment to help us deal with wild ponies as safely as possible. It also helped us with fundraising events (such as a Launch Party, Open Days, a Dog Show, an Equine Arts Day, a Quiz Night and a Pony Camp for Adults!) together with all the associated publicity, administration costs and insurance. Paul and Cilla King, who were at the heart of the people4ponies project, used and developed "non-confrontational" methods, which are extremely successful on all ponies, but are the only way forward for the ones that have been traumatised. Typically, this trauma has occured as a result of mutilating identification procedures, such as hot branding, ear cutting, notching or tagging, that have been associated with forced restraint and unsympathetic handling methods - the first close contact these ponies ever had with people. Within the group, it was clearly noticeable that the younger foals and ponies that had never had any reason to fear people were very easy and confident. The adult ponies with mutilations and unsympathetic handling were terrified of people. 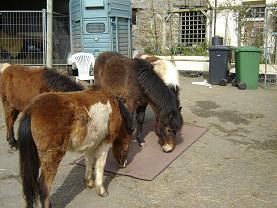 Many of the original group of 53 ponies are now in permanent homes and a few are out on loan. The younger untraumatised ponies are now being educated for riding and/or driving. Of the remainder, some are quite severely traumatised and fearful and need very careful handling. Ponies like this are unlikely to find homes. They do make very slow progress, and they are safe and cared for here at p4p. Our fundraising and Sponsorship Scheme helps us to care for them. 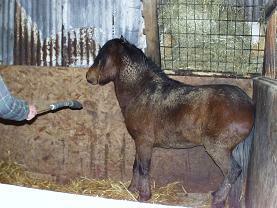 Due to the special skills developed by Paul and Cilla, very many ponies have been helped by the charity - some rescued from welfare situations, others visited on a short-term, rehabilitation basis from other charities or private homes because they needed help with rescued ponies that were considered "unhandleable". 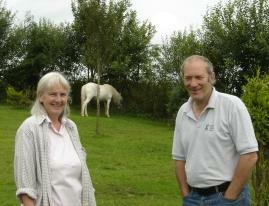 In 2012, after nearly 10 years of being dedicated to the pony project, Paul and Cilla retired from running of the charity. The running of people4ponies has been taken over by Faye Stacey. People4ponies continues to be dedicated to wild and traumatised ponies, and to the remaining ponies from the original p4p herd. Our wonderful p4p volunteers ensure the smooth running of the charity, and we are committed to ensuring that mutilating identification procedures are banned in the UK.